A stabbing in the western Finland city of Turku that killed two people and wounded eight is being investigated as possible terrorism, police said Saturday. The National Bureau of Investigation, which is heading the investigation, said the dead are Finnish citizens while the wounded include one Italian national and two Swedes. Police identified the suspect, an 18-year-old Moroccan citizen, but did not release his name. He was shot in the thigh by police and detained and was being kept in hospital under armed guard. Four other men — also from Morocco — were detained in the case but it was unclear what their connection to the suspect was. The Finnish Security Intelligence Service said the attack was "a likely terror act." Pekka Hiltunen of SUPO told reporters Saturday that the agency was investigating the suspects' connections to the Islamic State group, since IS "has previously encouraged this kind of behavior." Authorities believe he likely acted alone but they are not ruling out the involvement of other people in the Friday afternoon attack. 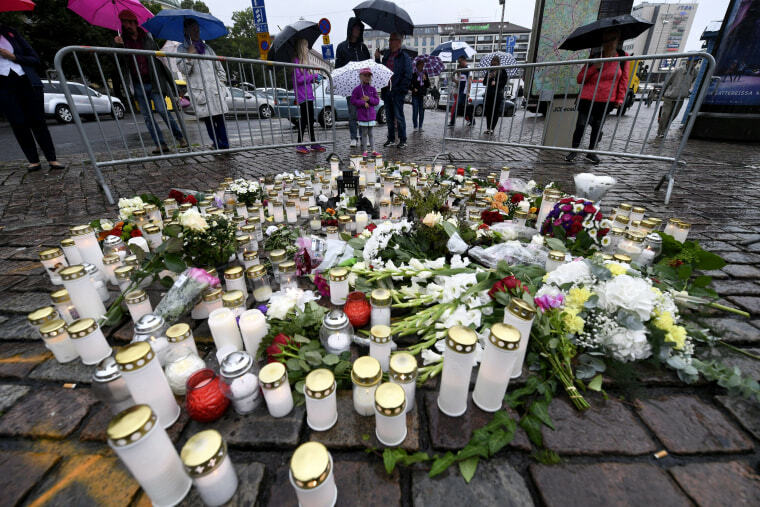 The country's president, Sauli Niinisto, visited Turku and condemned what he called a "shocking and cowardly act." He said officials are doing what they can "so that all Finns are able to feel safe." People laid candles and flowers at the scene of the attack in the evening. Laura Laine, who saw the stabbing from a nearby outdoor cafe, also returned to the square. "First thing we heard was a young woman, screaming like crazy. I thought it's just kids having fun ... but then people started to move around and I saw a man with a knife in his hand, stabbing a woman," she told Reuters. "Then a person ran toward us shouting 'he has a knife', and everybody from the terrace ran inside." "Next, a woman came in to the cafe. She was crying hysterically, down on her knees, saying someone's neck has been slashed open."